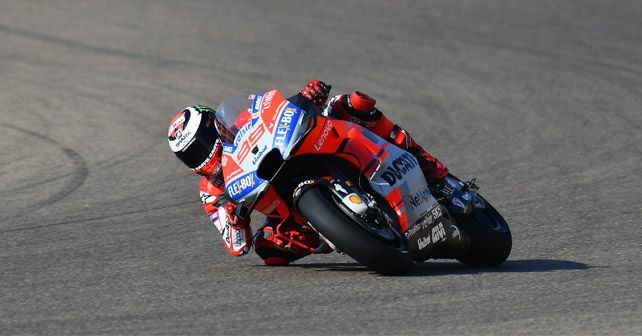 Jorge Lorenzo pips Ducati teammate Andrea Dovizioso and Repsol Honda's Marc Marquez in what's looking to be another three-way duel at Aragon. The Aragon Grand Prix is going to be another Ducati vs Marc Marquez duel as Jorge Lorenzo grabbed pole position for the race tomorrow. Alongside him will be his teammate Andrea Dovizioso in second position, while the Repsol Honda man is placed third on the grid. Today’s pole was Lorenzo’s third consecutive pole position in a row. He grabbed the top spot in the qualifying, thanks to his blistering lap that came in his last run, where he put a stunning time of 1m46.881s. Dovizioso was not far off in second (+0.014s), but he was caught in traffic in his final run. Similarly, Marquez was on provisional pole until the very last minute but lost it all in his final run, when he was following Dovizioso so as to use his opponent’s slipstream to post an even faster lap time. However, a couple of mistakes in the final lap cost him dear as he lost touch with the Ducati rider. Despite having a fast crash in qualifying, LCR Honda’s Cal Crutchlow managed to take the fourth spot, ahead of Suzuki’s Andrea Iannone in fifth and Repsol Honda’s Dani Pedrosa in sixth. The third row will be led by Pramac Ducati’s Danilo Petrucci (seventh), followed by Alvaro Bautista (Angel Nieto Ducati) in eighth and Alex Rins (Suzuki) in ninth. Jack Miller of Pramac Ducati rounded out the top ten. Factory Yamaha’s poor performance continued in Aragon with Maverick Vinales finishing the session in 11th. Valentino Rossi’s performance was even worse – he couldn’t make it to Q2 and will start the race from 18th position. It’s his worst qualifying performance since 2006.